What could be better than eating a piece of luscious, classic cheesecake or biting into a square of your favorite dark chocolate? 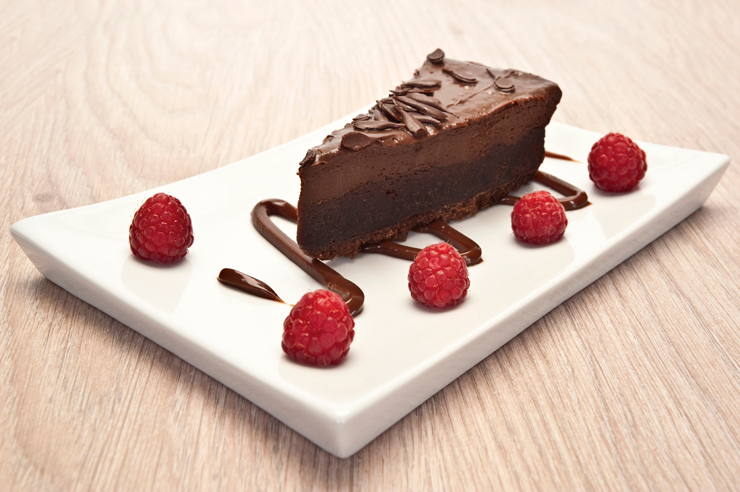 Eating this decadent chocolate cheesecake, of course, because it is a delicious pairing of these two classic treats! We like to serve ours with a scoop of dark chocolate ice cream. Here’s the recipe. Preheat oven to 350 degrees Fahrenheit. Butter a 9-inch springform pan that has sides that are 3 inches high and set aside. Add the cookies to a food processor and pulse until ground to a fine powder. Add sugar and pulse gently for a few seconds. Melt the butter in the microwave or in a small saucepan. Add to the food processor and pulse with the cookies and sugar until well blended. Pour the crumb mixture into the springform pan and press evenly onto the bottom of the pan. Bake for 5 minutes, or until the crust mixture is just starting to set. Remove from the oven and let cool on the countertop. Don’t turn off the oven because the temperature will be needed for the rest of the cheesecake. Chop the chocolate into small pieces. Fill a small saucepan about 2/3 of the way full with water and bring it to a simmer. Add the chocolate to a medium bowl and place it on top of the saucepan so that the chocolate can melt. Wait for the chocolate to get completely smooth, and then remove it from the saucepan. Let it cool for a minute or two. Chocolate should be lukewarm but still able to be poured. Add the cream cheese, sugar, and cocoa powder to a food processor and pulse until smooth. Add eggs one at a time and pulse each one until blended into the mixture. Add the melted chocolate and pulse until blended. Pour the filling over the prepared crust and smooth it with a rubber spatula until it’s even. Set the pan in the oven and bake it in the heated 350 degree oven until the center just starts to set and no longer looks wet. This should take about an hour. Remove from the oven and let it cool on the countertop for 5 minutes. Loosen the sides with a knife and place it in the refrigerator overnight. Just before serving, remove the cheesecake from the refrigerator and take off the sides of the springform pan, leaving the bottom in place for stability. Spread the top of the cheesecake with whipped cream and sprinkle it with the mini chocolate chips.